Apple's notoriously difficult-to-repair unibody MacBook design has been a sore subject for repair enthusiasts for years, prompting solutions provider iFixit to create a new battery replacement kit that will make it easier for at-home repairs. Priced between $89.95 and $109.95, iFixit's MacBook Pro Retina Battery Kits include all of the tools and instructions users should need to replace their own battery. Also included in the packages are batteries designed to fit within the various legacy Retina MacBook Pro designs, ranging from late 2012 until mid 2015. Given how durable and reliable Apple's hardware is, battery use over time is now likely the main point of failure— or, at least, diminishing returns —with legacy MacBook Pro hardware. 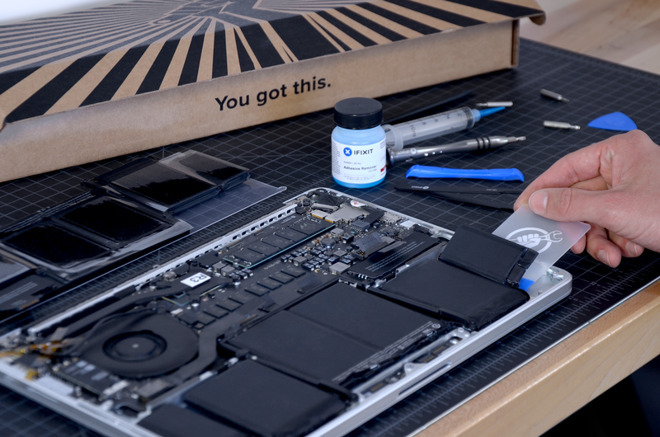 iFixit's new kits can give MacBook Pro owners a new lease on life with refreshed batteries restoring a full day's charge. iFixit says swapping the battery on a MacBook Pro with Retina display can extend the life of the laptop by another two to three years. Apple does offer its own battery replacement service for $199, but iFixit's kit comes in at about half the price, making it a more economical approach for users who feel comfortable dissecting their notebook. 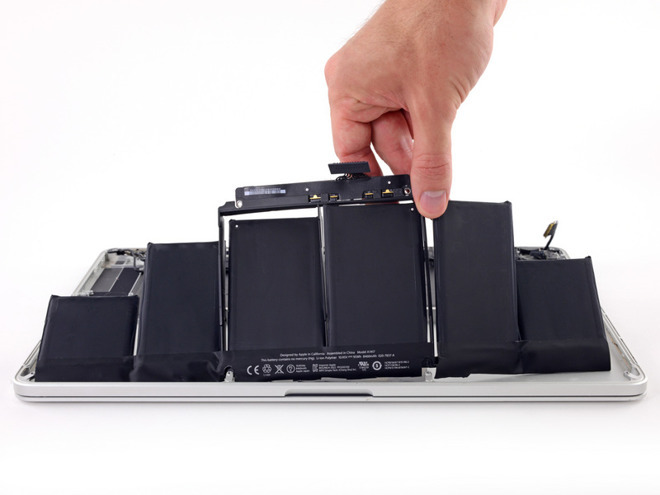 The Retina MacBook Pro features a glued-in-place battery that can complicate the repair process. iFixit's tools address this with a "blend of household chemicals" that are safe, but allow the adhesive to be removed. "The repair is still a fair bit of work: removing the battery requires a lot of caution and patience —but it's definitely doable with the right tools, the right instructions, and the right adhesive removal technique," the company said. After lasting for about four years, the MacBook Pro with Retina display design was succeeded in late 2016 by a new, thinner chassis with USB-C Thunderbolt 3 ports and a Touch Bar on high-end models. The new iFixit battery replacement sets are not designed for the latest MacBook Pros.